Could the stumbling food scene in Santa Monica Place be recovering? Z Pastabar recently opened, The Curious Palate jumped locations but not the ship, and The Cheesecake Factory appears constantly busy. 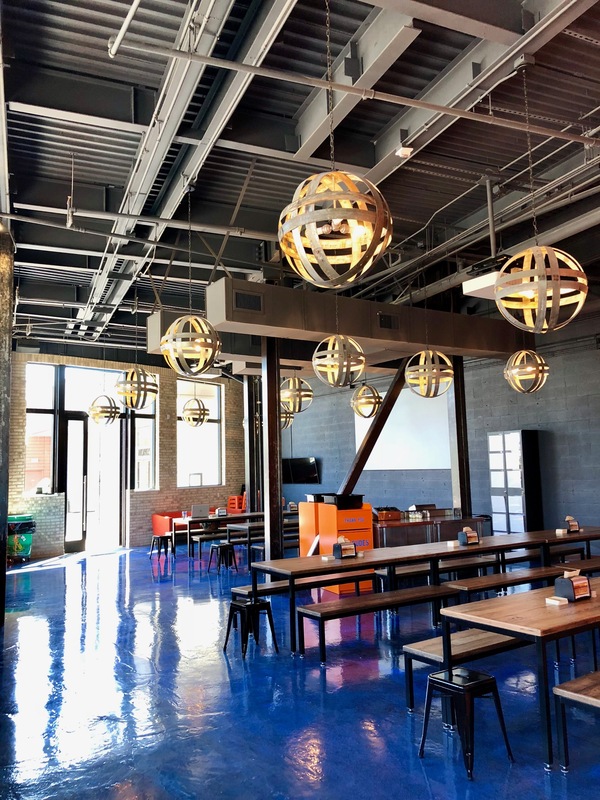 Yet there are still four cavernous restaurant spaces that remain idle. But soon you can make that three. 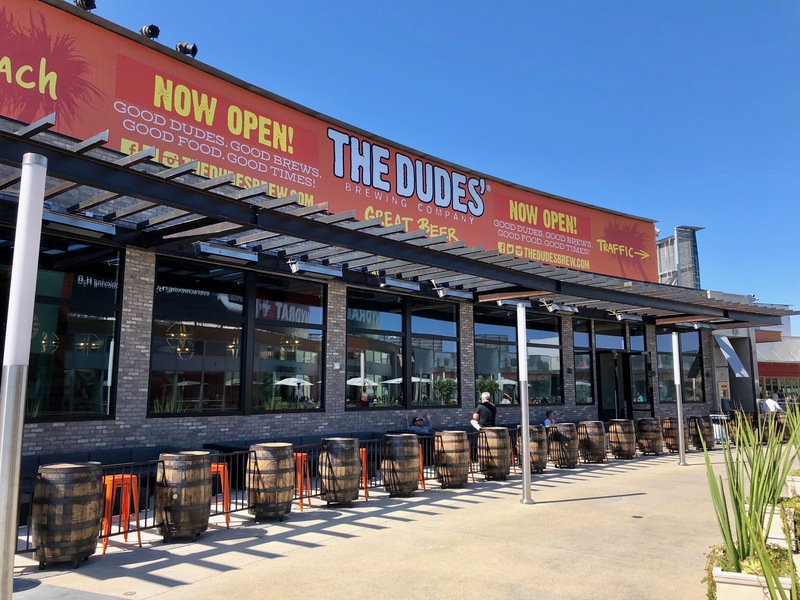 Signs are up on the front of the space that used to house Pizza Antica informing us that Torrance’s craft beer specialists The Dudes’ Brewing Company will soon be moving in. We wish them the best of luck. Sadly, the sputtering food scene that is the third floor of Santa Monica Place is about to produce another casualty. According to a spokesperson, after a 6 year run, Pizza Antica will permanently shut down the ovens the day after Labor Day, September 5th. (That means your last day for the Tuesday half-priced wine deal will be August 30th.) 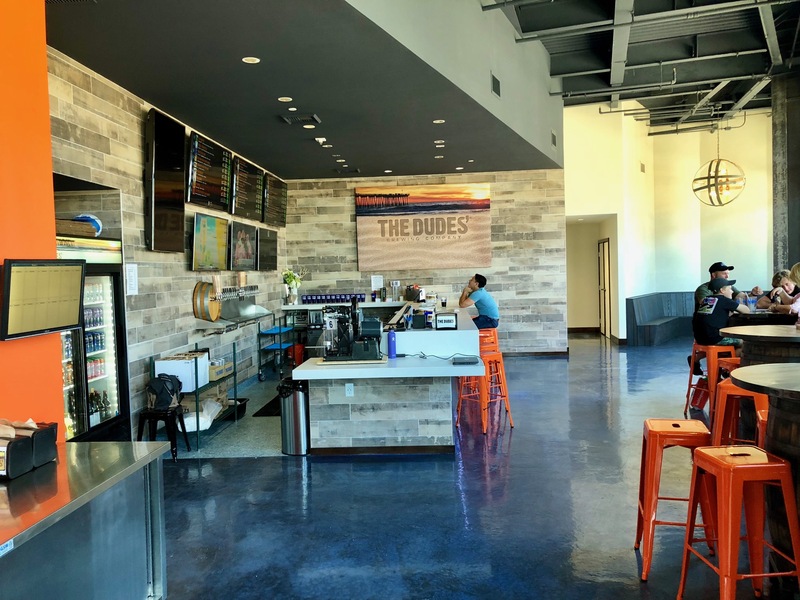 No word on what may take its place, and if you’ve grown fond of their seasonal salads and crispy pies, you’ll have to travel a bit as all their other locations are in the Bay Area. Pizza Antica in Santa Monica Place as well as Northern CA, is celebrating the launch of its new proprietary beer Birra Antica, with a “release week” from April 15th to April 21st. For $6 you can sample the brew with a taralli (Italian pretzel) developed by Linden Street Brewery that is described as “rustic, country-style, and spiced with fennel, black pepper, and cumin”. Read more at: pizzaantica. There are still a few good reasons to visit the third floor of Santa Monica Place. 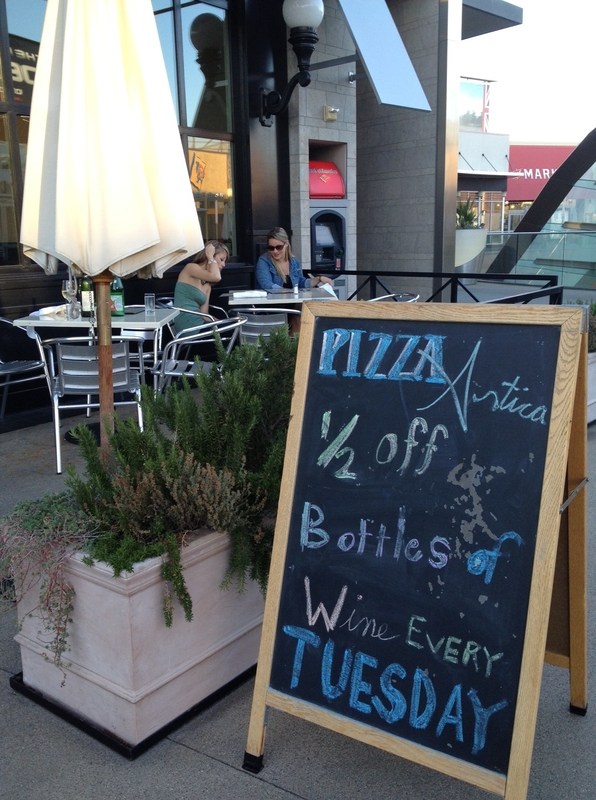 On Tuesdays, all bottles of wine at Pizza Antica are half off. With a largely Italian wine list, it’s a great opportunity to have a cheap and tawdry affair with an Arneis, Pecorino, or Fruilano. Check out their wine list here: pizzaantica.com. If you follow a gluten-free diet and miss pizza terribly, you’re now in luck! Pizza Antica in the Santa Monica Place Mall was kind enough to let us know about their new gluten-free menu that you can check out here: http://pizzaantica.com/pdf/GF_Menu.pdf. They have teamed up with Azna Gluten Free to produce pizzas that are Roman style, thin and crackly crusted. Pizza Antica is also offering the Italian corn-based pasta brand La Veneziane in its gluten-free pasta dishes. Buon appetito! Pizza Antica in the Santa Monica Place Mall was kind enough to let us know about a seasonal menu change: Gone is the beloved but wintery brussels sprouts salad (if you ask, they’ll give you a copy of the recipe). But hello artichoke fritti with lemon aioli, which are described thusly, “Fresh jumbo artichokes are trimmed to the heart and dipped in buttermilk and rice flour to make a crisp crust, then made succulent with the addition of lemon aioli.” Can’t you just feel summer in the air?